Meet Ludington artist Sarah Beth Stechschulte. 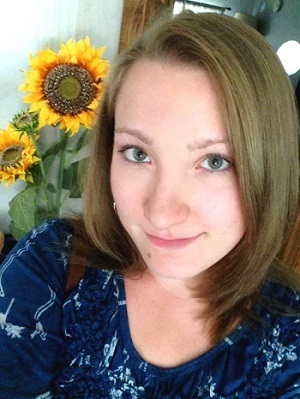 Graduate of West Shore Community College, Sarah Beth has a passion for everything art. Mostly focusing on painting and drawing, Sarah creates art inspired by local scenery, animals, interesting objects, and really anything that sparks her attention. Sarah also has some experience working with clay, after taking a pottery class at WSCC. She is also a musician, currently playing the tuba in the WSCC Chamber Ensemble and Wind Symphony, and she enjoys singing and playing her guitar. You can find Sarah's art on display and for sale at Shagway Arts Barn, Golden Key Art Gallery, and Petri Gallery. Be sure to browse her website, where you will find samples of her pieces...and if you find something you love, give her a call to purchase, or to order a print! 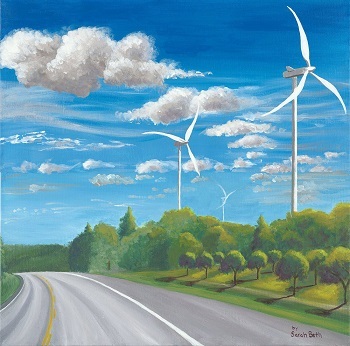 "Wind Power" Prints available in many sizes! Sarah Beth creates paintings of landscapes that inspire her from local scenery. She also enjoys painting animals, and family pets. 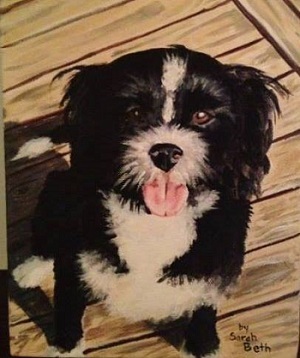 Sarah does affordable commission work of animals...if you have a pet that you would like her to paint, give her a call at (231) 510-2528 to get a free price quote! Sarah has several of her paintings available to purchase as a print, which is more affordable than purchasing an original work. Prices start at just $20 for an 8x10 inch paper print. Prints can also be ordered in any size desired, and shipped directly to you! To see some price examples of prints, take a look at Sarah's art pricing guide. Have you ever considered getting a painting or drawing done of a family pet, or maybe a special photo of someone you're close to? Or maybe even a picture of your home...Sarah Beth can do affordable commission work of just about anything. She has done several paintings of pets, and some drawings of people. She can even do a painting of a piece of jewelry! Sarah also has experience painting old furniture and giving it a new look. To find out more about her commission work, give her a call, or send her an email through the contact form on her website. By Sarah Beth is also on Facebook! If you are on Facebook, please "like" her page to receive updates about her work and to see more pictures.